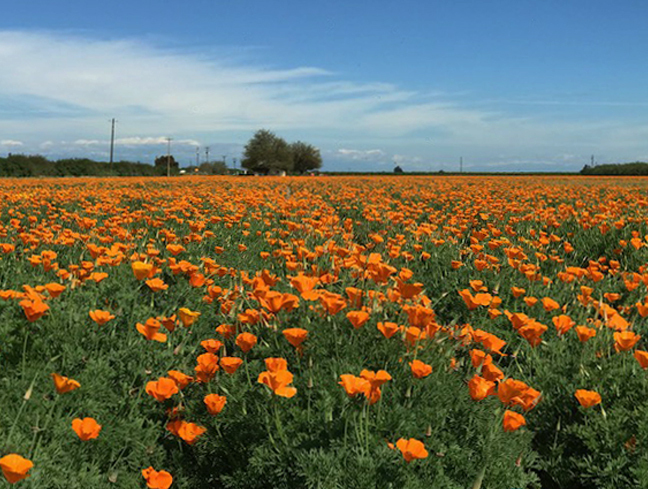 Last year a couple from the Central Valley walked into Seed Dynamics with a large quantity of poppy seed. 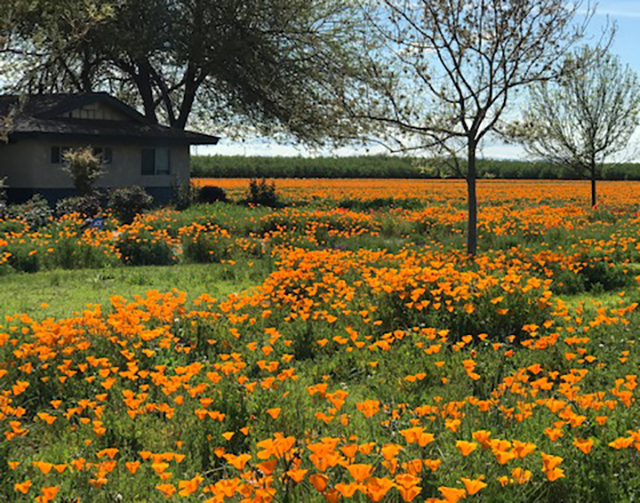 Charles and Trudy had been farming cotton, black-eye beans, wheat and almonds for the past 38 years on their property in Fresno. They had recently slowed down and were only farming the almond trees. 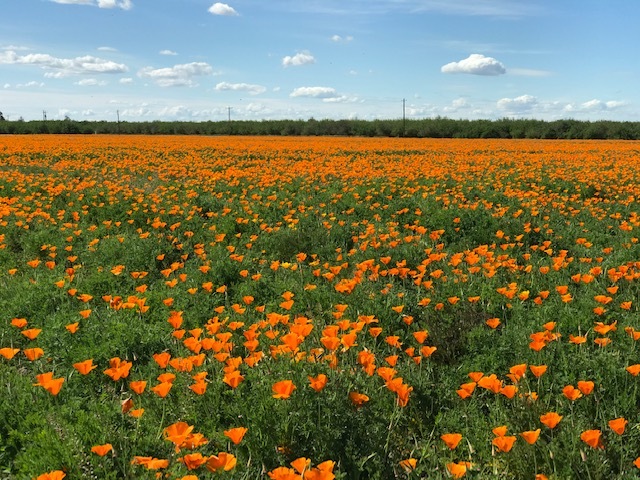 They had several fallow acres around their home and a passion for poppies! I have always loved poppies and have grown them in my yard wherever we lived. About a year ago I had this idea of going big…growing them around the house and utilizing these empty acres. Charles decided he needed the seed pelleted so he could run it through the planter he had. 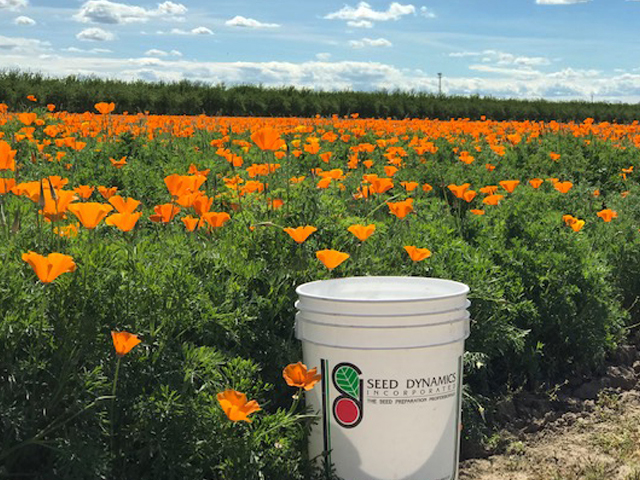 Seed Dynamics had never commercially pelleted California Poppies before. But our crop list for restoration projects does include a variety of flowers, so I knew we could help them. Apparently it worked! God’s food for the soul!! Thanks for helping us get this project going. I think it turned out better than we dreamed! Charles and Trudy enjoy family life with three children and eight grandchildren ranging from 18 years old to 3 years old. They consider themselves homebodies and enjoy living in the country. Trudy has her hobby of selling on Ebay and crafts and of course Charles loves taking care of the yard and poppies! Got your own field of dreams? Share it with us! Have your cows have their “foot masaige” lately.? Ha! Not sure about their cows but you can be sure their Almonds are pampered!